"Our time machine is now in pursuit. Nothing can match Dalek technology. The universe shall be ours. Conquest is assured." The Daleks test their time destructor on Trantis, which fails due to the fake Taranium Core. So they exterminate Trantis anyway! The Daleks summon a time machine from Skaro to pursue the Tardis and retrieve the Taranium. The Doctor is aware they're being pursued and briefly materialises on the pitch of the Oval in London interrupting an Ashes test match! The time machine arrives on Kembel and collects Mavic Chen to pursue the time travellers. 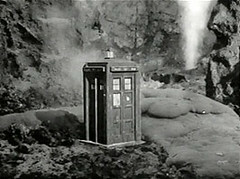 The Tardis arrives on a volcanic planet: the Doctor thinks their pursuer is already there. A short distance away his old adversary the Meddling Monk has materialised and is pleased to have found the Doctor. While the Doctor and friends are exploring the Monk damages the Tardis' lock. 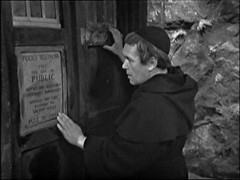 The Monk appears to the Doctor, and the Doctor congratulates him on escaping from 1066 where the Doctor marooned him by removing the Monk's Tardis' dimension control. The Monk tells the Doctor he has now stranded them on this planet, Tigus. He uses the sunlight, filtered through his special ring to repair the lock which can then be opened. The Monk vows that the Doctor hasn't heard the last of him! 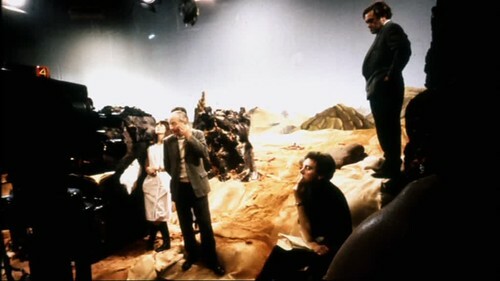 The Daleks and Chen prepare leave Kembel in the time machine as a countdown starts. The Tardis materialises in Trafalgar Square on New Year's eve allowing the travellers to witness the celebrations as the Daleks' countdown finishes. More fun in this episode, broadcast on New Year's Day 1966, hence the finale with the New Year countdown chillingly crossed with the countdown to the departure of the Daleks' time ship. In fact the later middle episodes of the Masterplan with the Tardis switching locations pursued by the Daleks are very similar to the structure of the Chase. The episode also brings back The Monk, played by Peter Butterworth, who previously appeared in writer Dennis Spooner's the Time Meddler. The Monk thus becomes the first non companion character to meet the Doctor in more than one story. Since we also get a return for the Dalek Time Machine, previously seen in the Chase, we've now got three time craft pursuing each other upping the ante on the Chase! The Doctor's using a device called The Time Curve Indicator to track their pursuer presumably the same as the Time Path Detector in the earlier story. MONK: Well, hello, Doctor. Keeping well? DOCTOR: Oh, no complaints, no. And you? MONK: Oh, so so, you know, just so so. MONK: Delighted to see you again, young man. STEVEN: Thanks. I wish I could say the same for you. DOCTOR: I suppose congratulations for your escape are quite in order. MONK: Oh, thank you. Most kind of you, Doctor. Yes, it took a bit of time, but I finally managed to bypass the dimensional controller. DOCTOR: Yes, a very interesting solution, yes, I'm sure, though I think it would make for rather an uncomfortable ride. However, I don't suppose it affected you very much, being an amateur. MONK: Yes, it was rather uncomfortable, but then, we can't have everything, can we? As for being an amateur, we shall see. Anyway, it was better than 1066. DOCTOR: Yes, I suppose so. SARA: What's he talking about, 1066? STEVEN: It's all right. We've met the Monk once before. I'll explain later. DOCTOR: And you returned here for one obvious reason, did you not? MONK: I'm afraid so, Doctor. Revenge is a strange thing, isn't it? DOCTOR: Yes, yes, quite, quite. Tell me, any plans? MONK: And all carried out as well. Oh, ho. Doctor, you remember you left me in 1066? Now I've marooned you on the planet Tigus. Look! Oh, it's funny this. Forgive me laughing, Doctor, but I don't seem to be able to control it. Well, goodbye, Doctor. Perhaps I'll come back one day and rescue you. I could watch/listen to Hartnell & Butterworth act together for hours. And the cricket match: I'm forced to ask was Douglas Adams watching? We know Terry Nation was fond of recycling and Malcolm Hulke believed "all you needed to work in television was an original idea, not necessarily your original idea." Well swap the Tardis for a Chesterfield Sofa and the sequence at the start of this episode is very similar to that at the start of Douglas Adam's Life, The Universe & Everything, itself recycled from a potential Adams Doctor Who story - Doctor Who and the Krikketman. when this story was transmitted Adams would have been nearly 14 so it's quite possible that he may have seen while home over the Christmas holidays from his boarding school at Brentwood. This is possibly the Doctor's first encounter with the game, though he may have been aware of it during his stay in 1963. He'll later take it up, claiming to have played for New South Wales and taking 5 wickets bowling Chinaman, a variety of Left Arm Wrist Spin, yet when we see him playing in Black Orchid he's a right arm batsman & bowler. I have to comment that I feel that the story gets the location of the cricket match a bit wrong though: On the day this episode was broadcast England were playing Australia in the second Ashes test at the MCG in Melbourne and having the Tardis materialise at the game being played that very day would have been a nice little touch. Or, leaving the setting at the Kennington Oval in South London, it might have been nice to have Ian & Barbara sitting in the crowd and seeing the Tardis materialise..... Which makes me think: although the Doctor & friends don't leave the Tardis, this visit is the first time the Tardis has returned to the same vague geographic location in a similar time: They were in London in the 60s at the start of an Unearthly Child and now the Tardis is back again. To the right of the camera are Jean Marsh and William Hartnell with Peter Purves hidden behind Hartnell. The man seated with a script on his lap is Douglas Camfield and the man stood on the rock is guest star Peter Butterworth. The ranks of the Daleks' alien allies are diminishing: Having killed Trantis this episode and Zephon in episode 3: Devil's Planet that leaves Mavic Chen & Celation, both of whom witness the test, and Beaus, Malpha & Gearon. No actors are credited for Beaus & Gearon after their appearance in episode 2 but there's some evidence that at least one of them is in episode 11. Two new supporting cast members are in this episode: Bruce Wightman is Scott, the Australian summariser on the cricket commentary. He'd previously played William de Tornebu in The Lion & The Knight of Jaffa, the first two episodes of The Crusade, directed by Douglas Camfield. He'll return as a Radio Operator in the first episode of Terror of the Zygons, also directed by Camfield. The English Commentator Trevor is played by Roger Brierley, doing a passable Brian Johnston impersonation although the commentators are apparently meant to be Peter West and Richie Benaud. 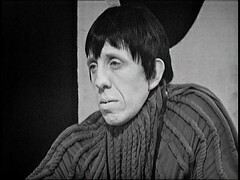 Brierly will later voice Drathro, the L1 robot, in the first four episodes of Trial of a Timelord. There's several extras in this episode playing either Cricketers or Revellers, or sometimes both! Some of them have past or future Who form: Ken McGarvie was a Saxon in The Meddling Monk and a Saxon Warrior in Checkmate, the 2nd and 4th episodes of the Time Meddler, directed by Camfield. He'll be back as a Tavern Customer in the first episode of next story, The Massacre: War of God, a Man in Newsroom in the The War Machines Episode 4 and a Soldier in Tracking Room in The Tenth Planet Episodes 1 & 2. Geoffrey Witherick is in the final episode of the Massacre, Bell of Doom, as a Guard, The War Machines Episode 3 as a Man in Market, The Dæmons Episode Three as a Villager and episodes Four & Five as a Coven Member, presumably the same character, Frontier in Space Episodes Two & Three as a Guard and Image of the Fendahl Part Two as a Security guard.